UIDAI does have its detractors. "Some of the resistance", The Economist said, "is principled, but much comes from the people who do well out of today’s filthy system. Indian politics hinge on patronage—the doling out of opportunities to rob one’s countrymen. [UIDAI's Aadhaar initiative] would make this harder. That is why it faces such fierce opposition ...". The resistance to UIDAI at government level comes from the Home Ministry and the Finance Ministry. Are these "the people who do well out of today’s filthy system", as The Economist put it? Are they the ones "doling out of opportunities to rob [their] countrymen"? The Economist may or may not be wise to jump into bed with UIDAI. But they run the risk – surely quite unnecessarily – of putting some very powerful noses out of joint. No more juicy stories coming their way from the Home Ministry and the Finance Ministry for The Economist any more. UIDAI are fighting a turf war with the Home Ministry, who have a rival identity management scheme of their own, the National Population Register (NPR). And the Finance Ministry were opposed to funding any more work by UIDAI, who were about to run out of money – until the Prime Minister sorted out a (slightly ham-fisted) truce. Not only that, but the statutory basis for UIDAI's work is questionable. The National Identification Authority of India Bill 2010 still hasn't been enacted. Why did The Economist do it? UIDAI has set out to create the world's "largest" biometrics database. The intent of using this database is for an inclusive purpose, unlike the west! Anything new has its own glitches; but look at what UIDAI have achieved in the last 18 months or so! Enrolling 1M users per day is a massive task. The focus, from what I have read, has been on enrollment - the authentication services have just started. There are technological challenges but just think of how this will benefit the common man, if UIDAI can align all the subsidy programs under one umbrella! And the man driving this is a very respected and principled figure. The very fact that he is involved brings enormous credibility to the system. As an Indian, I hope that UIDAI can prove this system and take a lead in the inclusive activity. Dear Sangeeta (if I may), I take my hat off to you. Not one blog – India's Search For An Identity... (with a witty reference to Jason Bourne). Not two blogs – 'Litter'-atos (which, I confess, on seeing the name at first I thought was going to be about refuse collection but no, it's literary criticism). But three – Food glorious food. I admire the energy. I have added your UID blog to the "Blogroll" on the right and I look forward to your next comments on the matter. Close reading. That's what my English teacher said was needed for literary criticism. There are many other necessities. But that's one of them. Close reading of UIDAI's plans for Aadhaar suggests to me, at least, that it won't work. Put the ingredients together, follow the instructions, and India will not get the delectable and nutritious dish offered. Instead, a lot of expensive materials will be wasted and after days in the kitchen there will still be no pudding. My fears are based on the questionable reliability of the mass consumer biometrics technology that Aadhaar relies on. And those fears are occasioned by close reading of the literature, please see the "Biometrics" section on the right. There's a lot of reading there. May I suggest that you start with Biometrics -- IPS, the Flat Earth Society and transformational cosmology. Your comment suggests that the success of Aadhaar is assured by the high principles and respectability of UIDAI's chairman. His high principles and respectability cannot make biometrics work. Technology works, not because of the fragrance of its advocate, but because in repeatable experiments it can be demonstrated to independent experts to deliver what it promises. The article above – the article you are commenting on – is about the disgraceful failure of the Economist magazine to maintain its standards for hard-headed analysis. Instead of weighing the technological evidence, they take the press release of an organisation under attack and reprint it as though it is editorial policy. And UIDAI is under attack, don't forget. It's under attack from the Standing Committee on Finance and from the ministry of Home Affairs. Their criticisms require more by way of an answer than a puff piece on UIDAI's chairman. Public money is being spent on Aadhaar. Lots of public money. The government, as the people's stockbroker, owes it to them to demonstrate that their investment in Aadhaar is wise. The objectives of Aadhaar are unimpeachable. But do you think they will they be achieved? Why? Dear David (and yes you may! ), firstly thanks for the compliments. Cooking and reading have been my interests, however recently I have been fascinated by UID - the concept, the execution, the organization everything! Secondly, thanks for blogrolling my blog. You definitely have a much more detailed analysis of UID on your blog. I will go through all your posts, and share my views! UIDAI is under attack from the Standing Committee of Finance, yes I agree - but who represented the Standing Committee? Were there any Biometrics experts, IT telecom experts? I will be writing my views on that soon. I have reached mid-way through the report! I don't disagree with your views on the technology part, Biometrics is one aspect, data network in India is another critical aspect to consider. I have read the PoC report published by UIDAI in terms of de-duplication etc, and I agree that a neutral third party expert should review the pilot results. Having said that, the UIDAI report has very impressive numbers - I extrapolated that to 1.2 Bn Indians and the numbers dont look very bad. See my post for details. And thank you for the information on Biometrics -- IPS, the Flat Earth Society and transformational cosmology, I will definitely read that. However, aren't the multiple authentication factors a kindof "backup" for failure of Biometrics? Is the Aadhaar strategy in place? Perhaps not completely - however the Aadhaar Payment Bridge, the Aadhaar Enabled Payment System linked to NPCI indicates that things if done right can be amazing! Do you know that annual welfare benefits in India stand at ~ 300,000 Cr INR i.e. 37.8 Bn GBP per annum! And the irony is that the welfare subsidy : efficiency ratio is 20:1. This entire subsidy is lost to intermediaries and in leakages. This is where Aadhaar strategy stands strong and good. Dear David (yes you may!). Firstly, thank you for the compliments - reading and cooking have been my so-called sustained interests for a while now. However recently, I have been very fascinated by UIDAI - the concept, the strategy, the vision, the organization - all of it. Secondly, thank you for sharing some pointers on biometrics, will definitely read the articles. And lastly, for adding my blog to the blogroll! You have a much more detailed analysis done for some of the aspects of UID, will read those posts and share my comments. Regarding close reading, yes that is a must. I am not a biometrics expert, so I will have to rely on both the reports provided by UIDAI and also the ones available publicly. Additionally, regarding the mass consumer approach of the technology used by UIDAI, I agree that there can be glitches: biometrics and GPRS remain the biggest concern to many. What can stalwarts like the Chairman do to influence this? Perhaps wrt GPRS and infrastructure availability a lot can be done, but I am not sure about biometrics. The results from UIDAI indicate that the match percentage increases if (i) two fingers are used (ii) concept of best finger detection if followed. UIDAI mentions that these results are after a thorough pilot done with the right TG of 80,000 people. In such disputes, I agree that I neutral expert or panel of experts should validate these numbers and share the analysis. 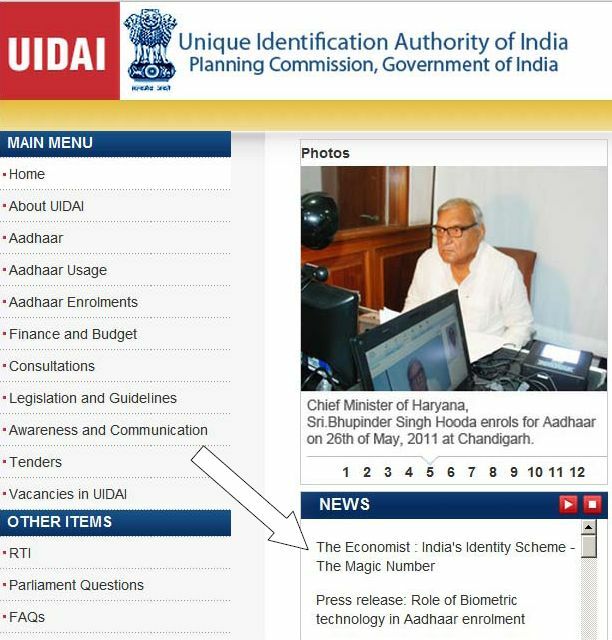 UIDAI is under attack, but from a committee which hasn’t done close reading either - atleast it doesn’t seem so to me. Their concerns are a bit muddled - they talk about lack of process compliance, security etc, which can be addressed via governance and rules, but by technology. They talk about FRR being as high as 15%; however FBI compliant FP sensors give a much-much lower FRR; and isn't UIDAI talking about STQC certified fingerprint sensors which follow exactly the same (or perhaps even more) stringent standards? In India, government spends 3000 BN INR = 37.8 BN GBP on welfare subsidies in various forms (cash, food, fertilizers etc) and the ironical part is that the welfare subsidy efficiency ratio stands at 20:1!! My money is currently being utilized in the least possible efficient manner. What UIDAI promises is that such benefits going directly to the beneficiary's account. See their proposal for a APB, NPCI's AEPS….these concepts are being tested out as we speak. The largest PSU banks are being mobilized to make this change happen. So, the vision is right. And as you rightly said the objectives of Aadhaar are unimpeachable. Will they achieve it? I don’t have the answer to that, but I think they are on the right track. Why? 3. How does all of this impact the technology - in a lot of ways: if biometrics is all about clean fingers, correct placement of fingers, ensuring the right amount of pressure is applied - well this can be achieved by training the field force. It is a mammoth task, but remember we are a country which runs the Census, which conducts pan-India elections. All of this is achievable. If the technology has hurdles, there are ways to overcome it via the "golden" finger detection mechanism, via the OTP authentication mechanism, via paper based verification for that UID number and then running analytics to ensure that the same UID number or the same field agent is not doing repeated manual checks. Technology hurdles remain, but are those real blockers to this inclusive initiative? I don’t think so, nevertheless I would like to read and hear expert comments before passing the verdict.